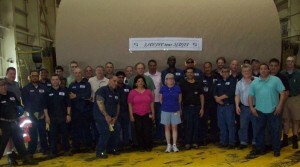 Mill manager Jay Hennessey (far right) and his team celebrate their milestone. Pratt Industries’ mill on Staten Island has just passed a major milestone – producing its 5 millionth ton of 100% recycled paper! Since it began operations in 1997, the mill has saved 85 million trees and prevented the equivalent of 400 million truck loads of waste from being landfilled! And it has produced enough paper to stretch from the Earth to the Moon and back almost eight times – all the while saving more than 5 million tons of harmful GHG emissions. Mill General Manager Jay Hennessey is justifiably proud of his co-workers. “Hitting this milestone is tribute to everyone who has played his or her part over the past 16 years,” he said. “It started with the people who had the vision and will to build a paper mill in New York City, through to the employees who worked through the construction, startup, expansions and weather-related disaster to keep the mill running.